Magenta: Carte bonne fête! / Happy Birthday card! Carte bonne fête! / Happy Birthday card! J'ai créé cette carte pour la fête de mon fils! I created this card for my son's birthday! Great card! 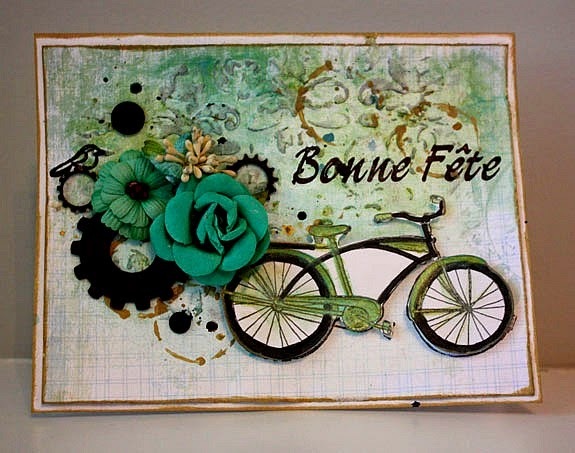 Love the background stamping and your bike is perfect! Really, really love this! Beautiful colors and texture. I love the flowers and gears together and that little bird sitting at the back. Great bike stamp. :) Thanks for sharing. Gorgeous, so much beautiful details to see! Vraiment mais vraiment très jolie!!! !